Of the more than 2 million low-income families at risk of being affected, 70 per cent are in work. New two child limit to tax credits rule means that from this month, April 2017, a third child born to low income families will miss out on up to £2,780 of tax credit support a year, and this will affect 8,000 families each month. 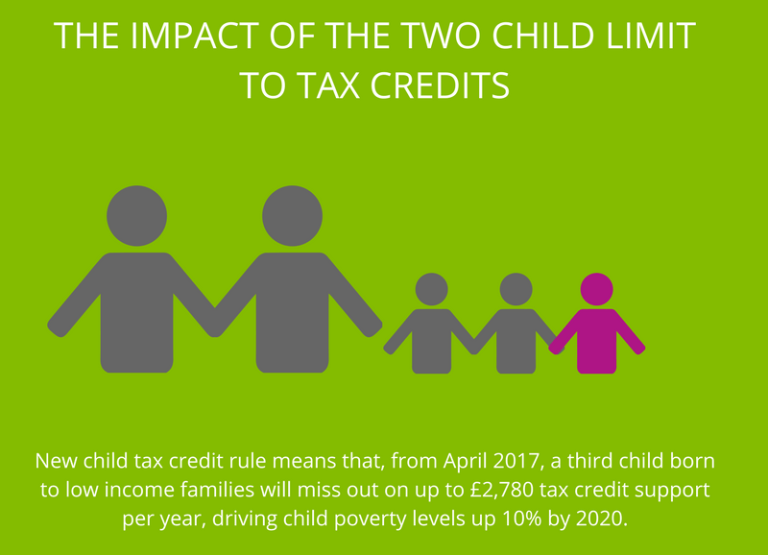 The amount of Child Tax Credit support available to families in the UK has been limited to two children since 6 April 2017. The two child limit to tax credits measure is to affect all households with two or more children who have an additional baby after this date. New independent analysis by Policy in Practice has found that more than 2 million low-income families are at risk of being hit if they have a third child – and 70 per cent of them are in work. The measure is supposed to save the government £1billion per year by 2020, and help it to reduce the public deficit and rebalance the finances of the welfare state. But, first of all, there is little evidence that the policy will have any impact on birth rates. This casts doubt on the extent to which this measure will achieve its second stated objective: ‘fairness in the benefit system’. Policy in Practice will be tracking the impact on birth rates in the coming months, but research has so far found that many potential parents are unaware of the changes. Based on national data collected yearly in the Family Resource Survey (FRS), Policy in Practise analysis estimates that 104,000 third or additional children will be born to these families in the next twelve months. The 8,000 babies born in April will miss out on up to £2,780 of tax credit support. And over 1 million children will be affected by the two child limit to tax credits policy by the end of this parliament in 2020. But this policy alone will drive an increase in child poverty of more than 10 per cent; 266,000 more children will be living in poverty by the end of the parliament. The over a quarter of a million children (256,000) already in poverty today will fall deeper into poverty as a result of this policy, and 609,000 children in the ‘Just About Managing’ (low to middle income) households will be pushed closer to the poverty line. Child Tax Credits were originally intended to provide financial support to low earners with larger families, yet those who have a third child after April will need to find £1,737 to make up the sum lost. How, should they have a ‘third’ child, has not been made clear. And then it is widely accepted that the costs of poverty, both human and financial, are significant, and that children who grow up in poverty have lower productivity as adults and have a higher risk of unemployment. There are also immediate costs to other public services that support families on low incomes. Policy in Practice has estimated that the increase demand in Free Schools Meals and Free Early Years Entitlement for two year-olds alone will cost an additional £270million per year by 2020 as a result of the increase in child poverty. Policy in Practice also expects additional pressures on housing and other local services, as some families already struggling to pay their rent are in the same position when with another mouth to feed. Policy in Practice estimates that support targeted to low income households, including housing, schooling and childcare will cost an additional £300 million per year by 2020 as a result of the increase in child poverty. Within the wider context of welfare reform, this policy represents another cap on the amount of public spending on welfare. It adds to measures which include a freeze on benefits, tighter limits on housing support and the introduction of an overall benefit cap, moving away from the needs-based principles on which the British welfare system has thus far been based. Policy in Practice will be assessing the consequences of this policy through rigorous scrutiny of the outcomes for those it affects, and will be tracking changes in demographic and economic circumstances for over half a million low income households across London. This will allow for birth rates and other outcomes, including movement into work, or the need to move home, to be tracked at scale. For more information about this project click here. Deven Ghelani, director of Policy in Practice, said: “The behavioural impact of the policy remains unclear, but we know that the costs of poverty are significant. “The government wants to restore fairness to the benefit system. This is a worthy aim, but the cost of this policy will ultimately fall on children in the families affected. To read Policy in Practice’s report, ‘The Impact of the Two Child Limit to Tax Credits’, click here.